Bridgewater On The Ball At Scarisbrick Hall! 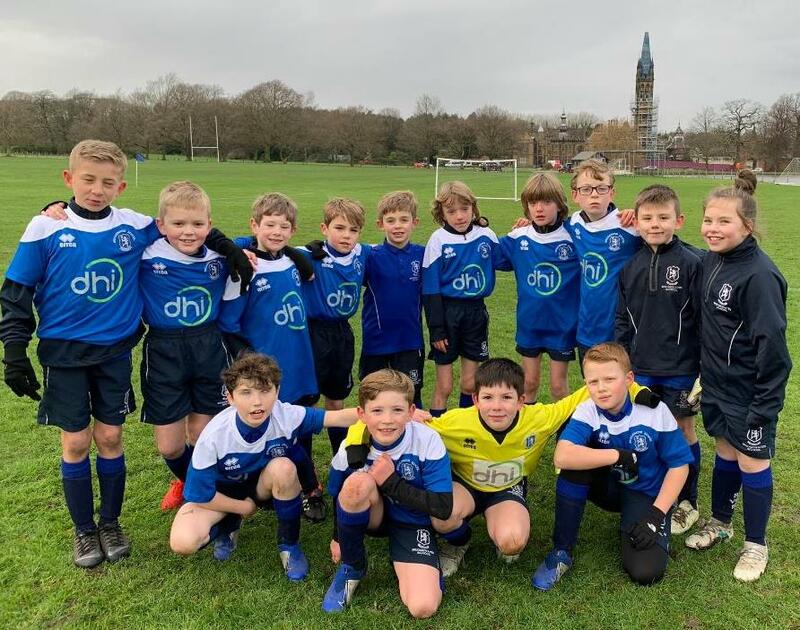 The sporting reputation of Bridgewater continues to grow, as the U9s travelled into deepest West Lancashire to accept a challenge from Scarisbrick Hall School. A combination of Prep III and Prep IV footballers arrived at the sumptuous grounds of the hosts but they were definitely not overawed by their surroundings. From the kick off, it was evident that Bridgewater were the stronger and better organised team collectively and individually. Alfie tested the opposing keeper early on with a series of long range drives, hitting the post, the cross bar and bringing out two flying saves that thrilled the spectators. We did not have to wait long for the opening goal, as Anton moved in from the right wing to convert a Joel cross. Moments later, Josh hit a curing shot destined for the top corner, until a brilliant save from a defender gave Bridgewater a penalty. Alfie converted the penalty, before going on to set up Tommy Jack for two quick goals. Luca C was replaced in goal without touching the ball, allowing Kian to make his debut. Kian made an important stop almost immediately, but was powerless to prevent Scarisbrick pulling a goal back from a deflected free kick. The last word of the half went to Bridgewater, as Josh rifled home a super shot from the edge of the area. Half time arrived with the score reflecting Bridgewater’s dominance, 5-1. In the second half, Scarisbrick rallied to put the Bridgewater defence under greater pressure. However, the centre back trio of Molly, Toby and Luca B snuffed out most attacks comfortably. In midfield, Alfie, Josh, Anton and Joel energetically broke up attacks and passed the ball around with increasing confidence. Meanwhile, Tommy Jack was a constant thorn in the side of the home defence. The pleasing element of the game was how well the team were keen to pass the ball around and the strength in depth of the squad was a pleasure to see. Sebastian had his best game yet, Kian looked competent in goal, Alex continues to develop his tackling and awareness, whilst debuts were given to Harrison and the combative Samual. Bridgewater continued to create changes throughout the game and the goals flowed at regular intervals. Tommy Jack and Josh both completed their hat tricks, whilst Joel chipped in with a goal at the end of the game. The match finished 9-2 in favour of Bridgewater and we now look to see if the U10s and U11s can match the U9’s performance when they travel to Scarisbrick next week. Well done team on a very impressive display today! 7 Responses to Bridgewater On The Ball At Scarisbrick Hall!